Three years ago, nurse Zoe's son Ethan was found drowned in a muddy river by their home, along with his best friend Josh. With no witnesses, their deaths were ruled a tragic accident. Having taken three years to cope with the loss of her son, Ethan Monaghan, Zoe‘s world is turned upside down yet again, due to this one email: "You need to find out the truth about what happened to your son down by the river three years ago. Don’t let this rest. Don’t believe the lie. It was no accident." Needless to say, Zoe becomes quite desperate and is determined to find out who sent it. Ethan and his friend Josh were 14 years old when they tragically died. Other things she wonders: Why three years later? It was an accident, wasn't it? After several more emails come her way, she realizes that someone is deliberately targeting her. After all, her son died along with his best friend Josh, yet Josh's mother has never gotten one single email. Zoe asks a lot of questions. She repeatedly questions Josh's mother, as well as some of their friends. Meanwhile, many complicated situations come to light. There are things about Josh's parents that truly disturb Zoe. Then her relationship between her husband and her other son Harley come into play. This story is mainly told from Zoe's first-person perspective, so much so that I was truly absorbed. I felt her pain on many levels. Her roles as a mother and a wife were truly very touching. Other chapters also include other viewpoints. The story is also peppered with the creepy thoughts of an untold individual. Who this person is and how they are connected with the death of the two boys remained ever present in my mind. Then there were several twists and turns. They mostly came in the form of the continued emails. So very chilling. There is also a shocking change of events that might be just enough to destroy Zoe forever. Quite naturally, I flew through the pages. As a reader, I was more than eager to know what really happened to those boys and what would happen to Zoe in her personal life. The other characters in the story, Jake, Harley, Roberta and Adrian, were equally compelling, even if there were ones that I did not like. The story all came together. 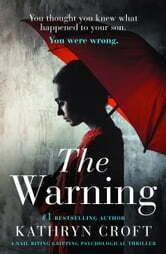 The Warning is truly an exceptional read. I was in no way able to guess who penned the notes. But, when I got to the end, boy was I shocked! Here you have a story that began as tragic, so we knew going in that there it was certainly very unlikely to have any sort of a happy ending, but the conclusion! Let's just say that it was worth the read, because Kathryn Croft took readers down what may seem like rabbit trails only to present us with more than one surprising finality. Well done. I highly recommend this book to any lover of psychological thrillers. I checked Goodreads and was delighted to see that Ms. Croft has written several other books, which seem like they are also psychological thrillers, which, by far, is my favorite genre. I will most certainly be putting her backlist in my TBR and will be following her for future titles. Many thanks to Bookouture and to NetGalley for this ARC to review in exchange for my honest opinion. A book of many layers. I love books with layers. A death in a family - especially of a child is often a catalyst for change. Often the parents can't cope together and the family falls apart. The families here have weathered the loss for 3 years, until a simple email rips them apart again. Secrets held for those three years bubble up to the surface, threatening to destroy all in their path. An interesting read that kept me gripped to the end. OMG Kathryn Croft has done it again!!! I devoured this book in 2 days!!! I absolutely loved it along with all the other books I’ve read of hers. From the beginning to end kept in suspense and shock. I really didn’t see any of it coming. This is definitely the kind of book I would recommend to all my friends. 5 Stars on this one. Keep up the good work Kathryn Croft. Very entertaining with many twists that keep you guessing.